Sedation is no longer necessary for infant & child MRI scans. The MedVac vacuum immobilization bag safely & securely fastens around the patient to restrict movement, therefore reducing repeat scans. 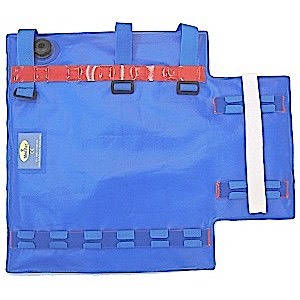 MedVac's air-tight, chambered bag comes filled with tiny, evenly spaced beads. Simply wrap the bag around the infant, secure the straps, hook the bag to a pump and evacuate the air. The bag will become rigid around the infant without squeezing or applying pressure. When finished, simply release the valve to allow the bag to re-fill with air, then undo the straps. The unique patented multi-chambered system that makes up the interior of the MedVac vacuum splints makes them ideally suited for Magnetic Resonance Imaging. Thin, flexible, easy-to-use, and very stable the patient is comfortably stabilized during the scan resulting in optimal first time images.